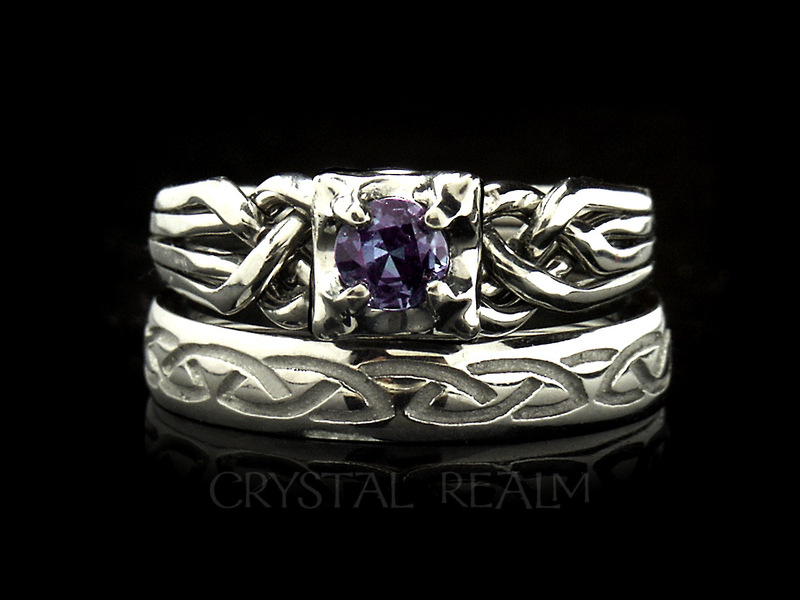 Genuine alexandrite in a very high quality is blue-purple under some lights and a rich teal blue-green under other lights. 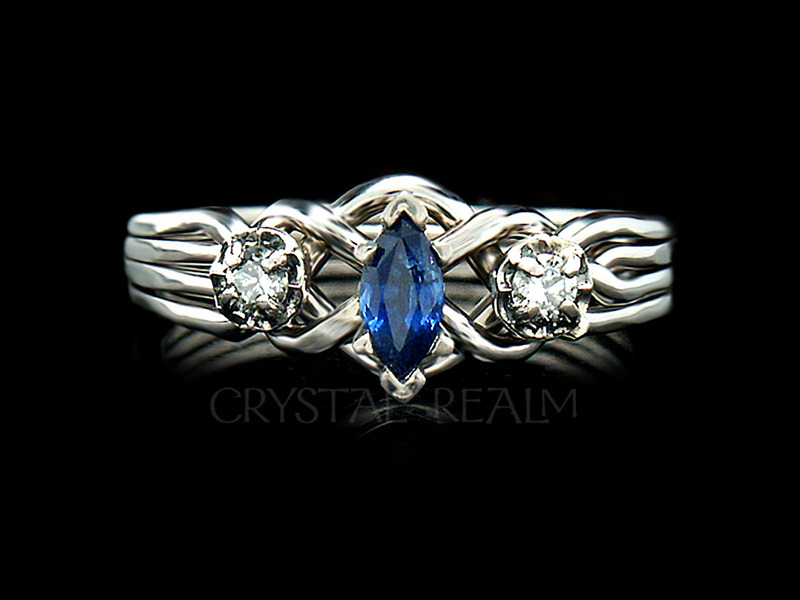 This Guinevere puzzle ring is set with a 4mm round stone that is approximately 0.24 to 0.26CT. 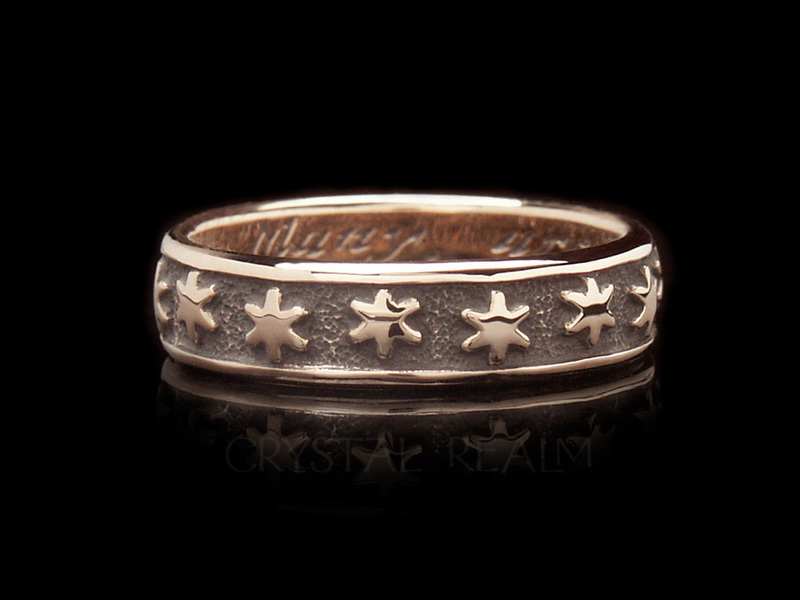 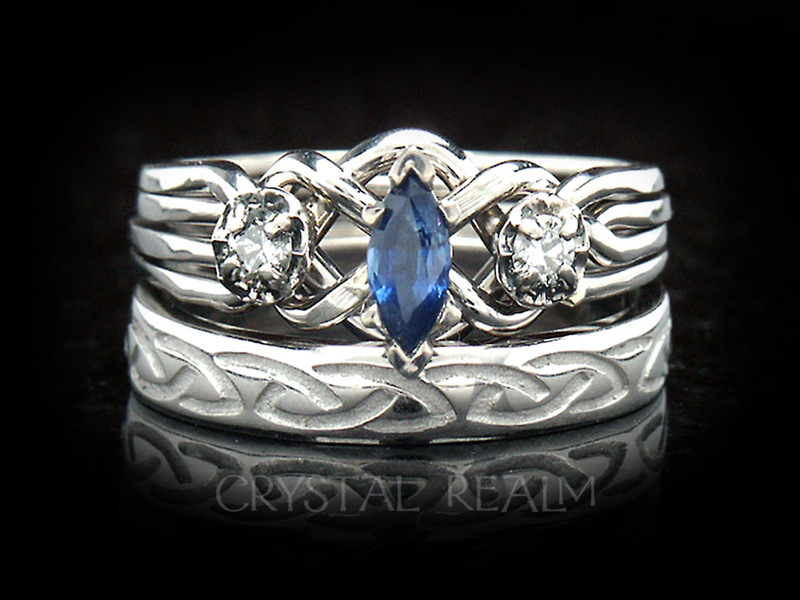 The engagement ring is a genuine working four-band, Celtic-inspired puzzle ring that you will enjoy learning to assemble using our video, animated and written instructions under a link below on this page. 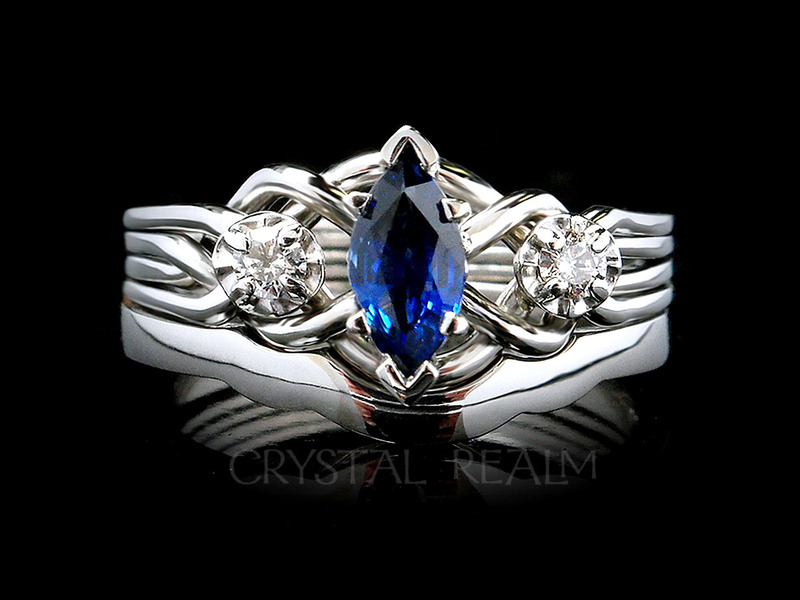 This puzzle ring is hand-woven, unlike the majority of puzzle rings, and yours will be custom-woven for the very stone that you select, making your ring a true, one-off original work of art. 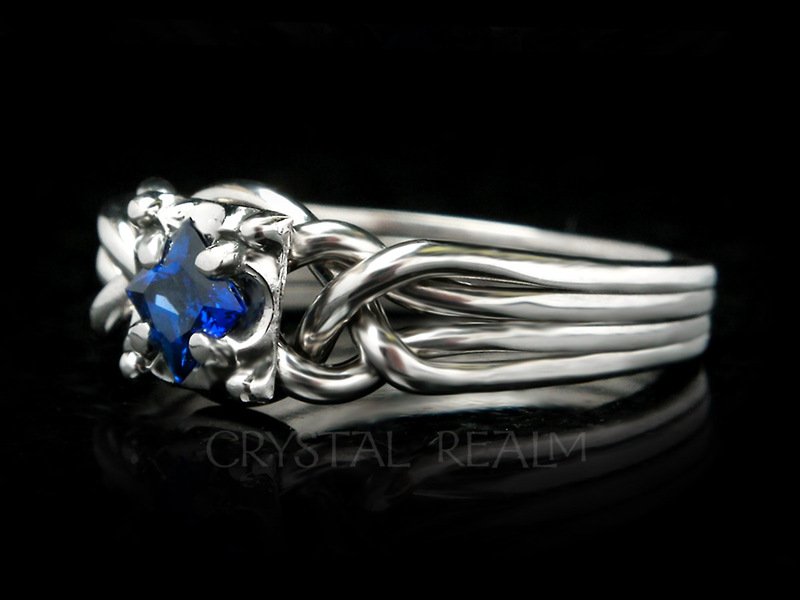 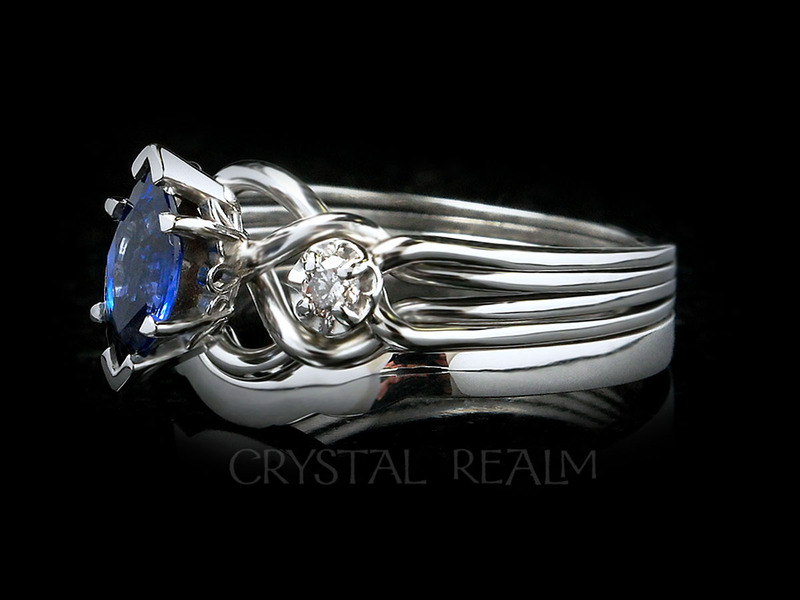 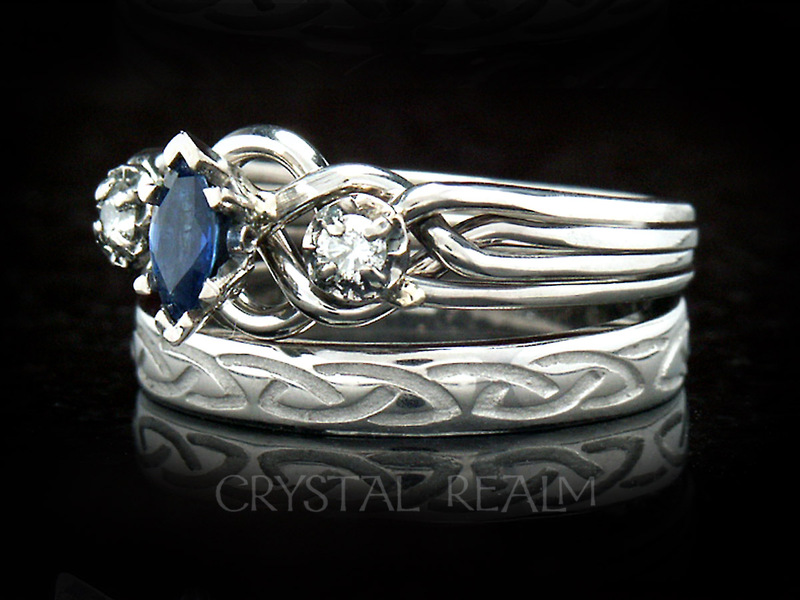 A recessed Celtic eternal knot band with a width of 3.4mm is paired with this engagment ring, for a total width at top center of about 9.5mm or 3/8 in. 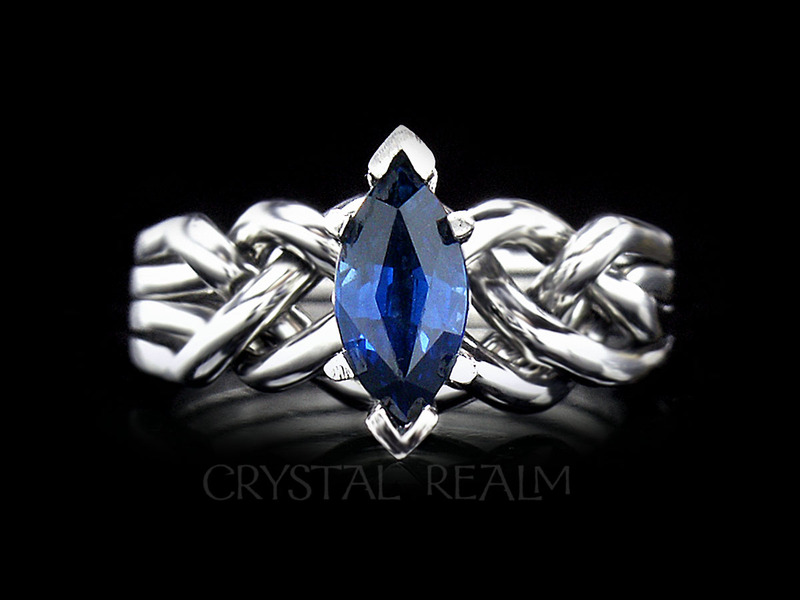 Precious gemstones: The base price on this page is for this set with a 4mm genuine Alexandrite. 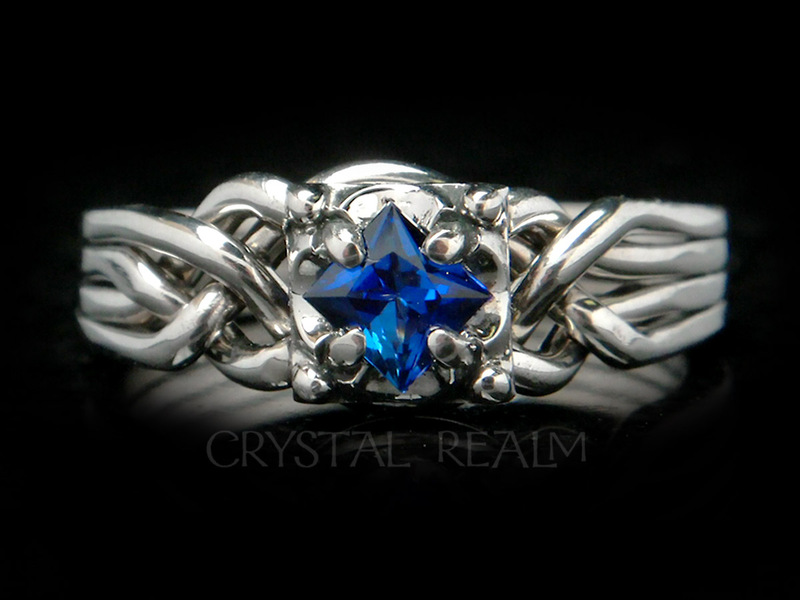 You may select a different stone by telephone order. 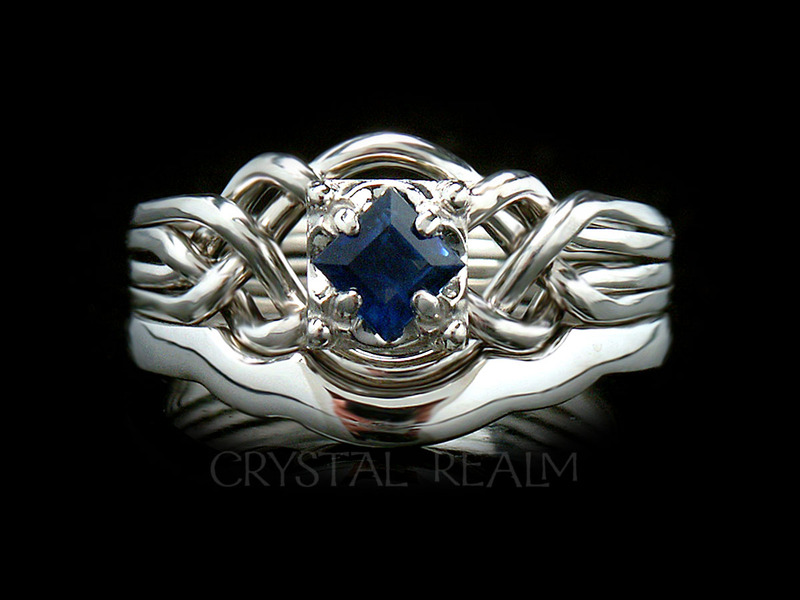 Puzzle ring weave: The ring shown has a tight weave, which makes the sides of the puzzle ring quite flat, thus fitting nicely with the wedding band. 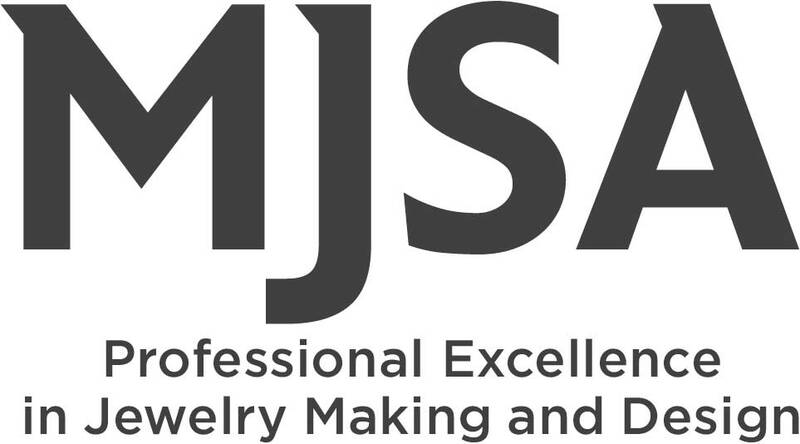 Sizes: Whole, half, and quarter sizes 3.5 to 9. 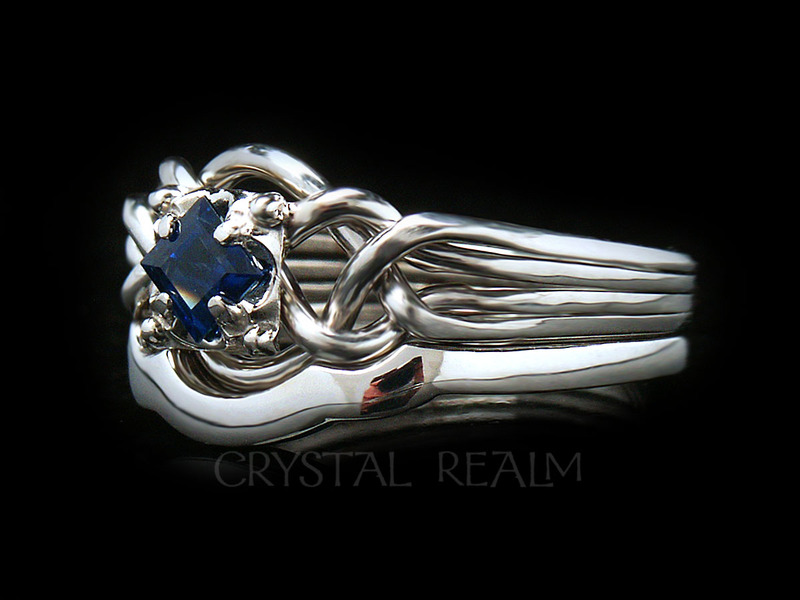 The Guinevere alexandrite puzzle ring is artisan-crafted in the U.S. and is exclusively offered by Crystal Realm. 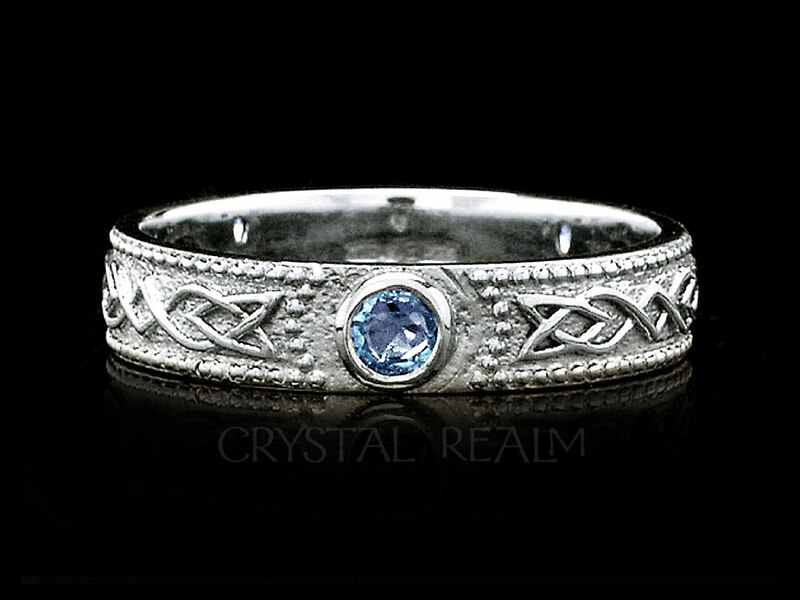 The Celtic wedding band is hand-made in Ireland and is hallmarked by the world-renowned Dublin Assay Office in Dublin Castle, the oldest continuously operating assay office in the world, since 1637.